Bidar is an important tourist and historical place in Karnataka, India. It has many important touristic places to visit. Bidar fort is one such fort in Bidar. It is located in the north eastern part of Karnataka and borders Maharashtra and Telengana. It is believed that Bidar got its name from Bidri works. Bidiru is a Kannada word which means Bamboo. Bidar is quiet far from Bangalore city. It is around 700Kms from Bangalore, however the connectivity between Bangalore and Bidar and Bidar to different parts is very good. So it should not be a problem to travel to Bidar. Bidar has been ruled by many dynasties like Rashtrakutas, kalyan Chalukyas, Kalachuris and Kakatiyas. Bidar was the capital of Bahamani sultans. Ahmed Shah Bahman laid the foundation for Bidar fort. The old fort which was redesigned had beautiful gardens, mosques, palaces and educational institution. Bidar has semi arid climate. It is too hot in summers especially April and May and cold months are November and December. In winters the minimum temperature dips to 11oC and in summers the maximum temperature rises close to 42oc. Bidar is called as City of Whispering Monuments. In total Bidar have 98 monuments out of which four national monuments are protected by archaeological survey of India and 14 are protected by Karnataka state Archaeological Survey Department. 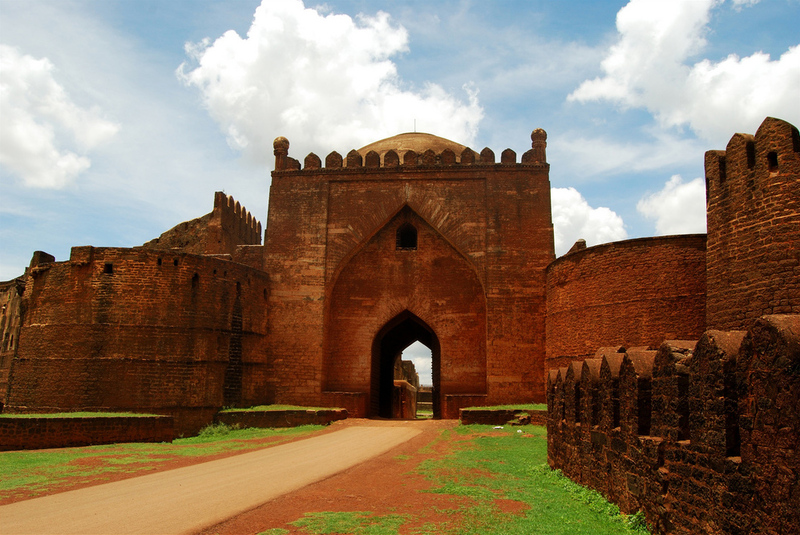 Bidar Fort is one of the important forts in Bidar district. It was built by Ahmad Shah of Bahmani dynasty. The fort is located on the edge of the Bidar plateau in the state of Karnataka, India. Bidar fort is spread over an area 12 square miles. It is 2200 feet above sea level and faces Manjira River. Manjira River is a tributary of River Godavari. Another sub tributary river Karanja drains the low lying area and finally joins the Manjira River. Even though Bidar fort is a deserted place now still tourists can feel the beautiful history of the dynasties that ruled in Southern part of India. The fort still has bastions, fortifications, moating and museums. Entry is free and photography is also free so one can take good number of photos of the fort. The fort has some beautiful history. The fort has witnessed rise and fall of many important dynasties like Bahamani, Satvahans, Chalukyas, Rashrakutas, kakatiyas,Mughals, Sultanates and the Nizams. Ahmed Shah of Bahamani dynasty made Bidar as its capital and laid the foundation for this beautiful fort. The structure of Bidar fort is very interesting and beautiful. It is in the shape of Rhombus. Bidar fort has Islamic and Persian architecture. The fort has seven arch gateways from east to west. Mandu Darwaza is the main gate of the fort. The second gate is named as Sharza Darwaza. It was named so because of the lion carvings on the wall. Gumbad Dharwaza which has Persian architecture leads to main complex. Gate number three and gate number 4 has no names to it. The fort consists of 37 bastions with canons. Munda Burj is the biggest among all. The parapet walls and other walls have honeycomb windows which were meant for firing when enemies attacked the fort. The three layers moat covers the Bidar fort. The moat has a depth of 30feet and good width between the glacias and partition wall. The fort has many beautiful buildings within it. Rangeen Mahal is the most beautiful among all. 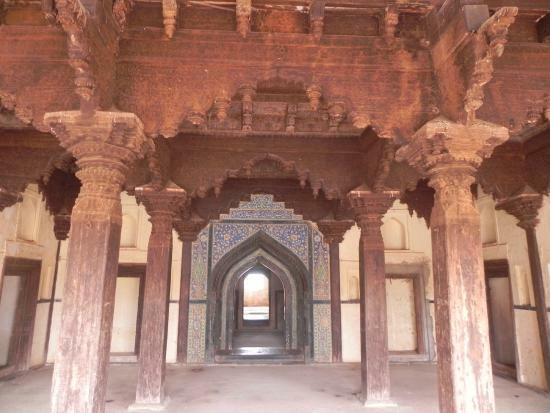 The fort also has audience hall, mosques, palaces, madrasas, gateways and gardens. The museum is an important place inside the fort. It has collection of swords, guns, canon, canon balls used during Bahamani sultanate period and Barid Shahi. As ones moves further from the museum there is a beautiful Turkush Mahal. It is built in India Islamic style of architecture. It was built for a Turkish wife of Bahamani sultan in the year 1432. It is believed that Mahal was built mainly to witness the functions during the Bahamani and Barid period. Some also say that the Mahal was built mainly for women to witness the animal fight. Most part of the Mahal is in ruins now but still one can imagine the beauty of the Mahal during the Bahamani period. Another important and most beautiful Mahal inside the fort is the Rangeen Mahal. This was built by Mohammed Shah during early 16th century by using different coloured tiles. The Mahal consists of tanks, baths and underground rooms. It is believed that the royals used this Mahal as summer palace. The palace was beautifully decorated with pearl engravings by Ali Barid. From here one can move to Solah Kambha Mosque. Solah means 16, the mosque has 16 pillars with long big arches. This was built by Qubil Sultani in the year 1423. Taktht Mahal is another important Mahal in the fort. This was built in 1432 as a throne palace. This Mahal was used for addressing the issues of private audience and court members of Bahamani kingdom. Taktht Mahal has witnessed many coronations of Bahamani and Barid Shahi rulers. Diwan I am was a place for public audience. It was rectangular in shape with huge wooden blocks. It was designed in such a way that it could accommodate large number of people. Bidar which is describes as city of Whispering monuments has four National Archaeological monuments that are Bahamani tombs, Barid Shah tombs, Bidar Fort and madarsa Mahmud Gawan. Some of the other important places to visit in Bidar district Narasimha Jhira cave temple, Chaubhara and Gurudwara Nanak Gira sahib.